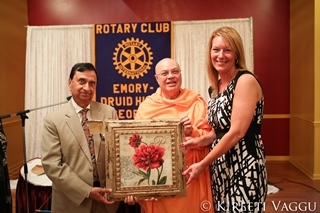 Swami Adhyatmanandaji was keynote speaker at the 2014 annual banquet of the Rotary Club of Emory Druid Hills. 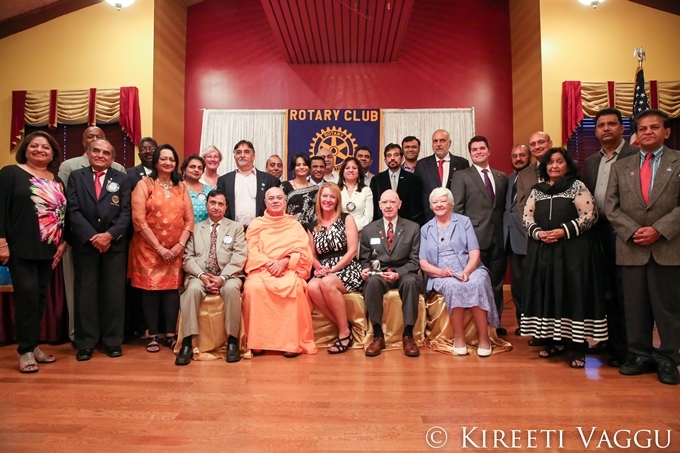 The Rotary Club of Emory Druid Hills (RCEDH), with its diverse and international membership, installed new office bearers at its June 25, 2014 annual banquet at the Palace restaurant, Norcross. Past District Governor Barry Smith inducted Chandler Sharma as president of the club for 2014 – 15, starting from July 1. Members of Chandler Sharma’s team are Ravi Chander – immediate past president, Shiv Aggarwal – vice president & president elect, Ravindra Singh – Secretary and Chair of Club Administration Committee, Bhairavi Nadgonde – Treasurer, Susan Sweeney and Naveen Shroff – Sgt. of Arms. Barry Smith congratulated new office bearers and each of them took the oath to serve the club to the best of their ability. The theme of the induction ceremony, apart for aiming to be the best club, was “The Year of the Happening.” The new inducted officers will be working towards achieving Rotary goals and giving back to the community. Rotary Club President Chandler Sharma and Swami Adhyatmanandaji present a memento to District 6900 Governor Alicia Michaels. Ms. Alicia Michaels, District 6900 District Governor, was guest of honor, and her address uplifted the induction ceremony. She talked about the “Power of One” and how everything we do makes the world a better place. 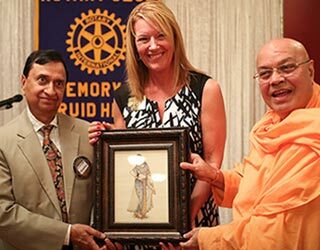 Chandler Sharma, president of RCEDH, and Rotary District Governor Alicia Michaels make a presentation to Swami Adhyatmanandaji. Swami Adhyatmanandaji, President of Sivananda Ashram, Ahmadabad, India was the keynote speaker. His words of wisdom on building peace across nations, meeting basic human needs, leadership , attendance, and service above self were outstanding. Present also was Ben Hunter, Assistant District Governor, who has been supportive of the club in many ways. Dr. Nazeera Dawood emceed; her humorous presentation style was much appreciated. An icebreaker left every last person in the room sitting with smiles. The ceremony began with the recital of convocation and the Pledge of Allegiance by Dr. Mel Fareed. The 2013-2014 leaders were awarded certificates for their service. “Club Member of the Year” was awarded to Mr. Mustafa Ajmeri. Chandler Sharma’s acceptance speech was empowering as he addressed the group on the importance of charity, leadership, and community contributions which are needed to carry out RCEDH’s desired and planned charitable activities. He detailed his plans for his presidency and thanked past and current leadership for their valuable contributions. Dignitaries with Rotary Club members and their families.